I must admit it’s only been in recent weeks that I have learnt how small my boat’s engine is. Even at ‘top speed’ I am sure my boat doesn’t reach the 4MPH canal speed limit, I have seen one-legged rabbits overtaking my boat on the towpath. A recent chat with another boater on the marina revealed his boat has a 28hp engine – whereas my little chuggy boat can only muster about 9hp. It has taken two years to learn this, reflecting my total lack of knowledge about engines. For those of you who are engine aficionados Pea Green has a 1973 Sabb 9HP HG engine. For those of you -like me- who aren’t engine savvy Sabb is a Norwegian marine company (not to be confused with the Swedish car manufacturer Saab). Sabb are known for their reliable marine engines used in fishing boats and lifeboats, think fishermen in arran jumpers and the hardy engines that keep their boats going. 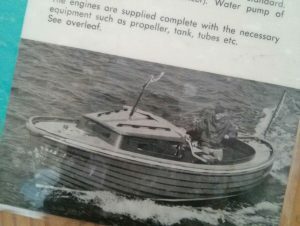 Even their old 70s advertising includes a jaunty fisherman wearing a jumper as he uses his ‘rugged’ engine – though perhaps the photo was taken for a knitting pattern. The tough nature of these engines does give me great faith as I chug to the edges of Northamptonshire on the still waters of the Grand Union. I don’t think my little Sabb could deal with the rigours of the North Sea, and I am in awe of a bloke who recently took his Springer narrowboat across The Wash (though admittedly he probably had a bigger engine and propeller than me.) I am not even sure Pea Green could cope with a river – but that probably has more to do with my helmswoman incompetency than the power of the engine! As demonstrated last year when I came out of a lock at Braunston as the weir next to it was overflowing – despite having full power on there was absolutely nothing I could do to avoid smashing into the lock entrance wall. After the lock incident the thought of battling rising rivers, currents and up-stream /down-stream navigation just seem way too much. 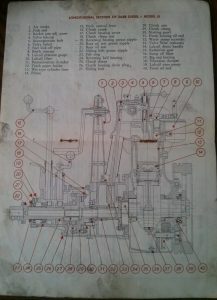 The plan for the Sabb H engine – can you find the crank handle? As with all things to do with Pea Green I am trying to do ‘engine stuff’ myself, though this particular learning curve does seem mammoth. 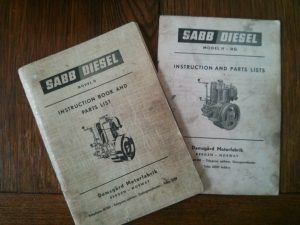 The boat came with two well thumbed original engine books. As I looked at the engine plans with their maze of lines and numbers for the first time I did feel overcome by a sinking feeling as I could make no sense of them. My Dad, on the other hand immediately identified bits to be greased and stuff I should be aware of. My previous engine experience took place back in the late 80s when as an eager new driver, I did a car maintenance course. 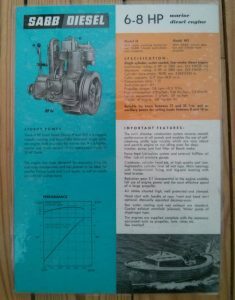 Though that was in the days when you didn’t need a degree in computer science to dabble with a car engine, and most of the information went in one ear and out of the other. As a result the ‘work’ (I use this in the loosest sense of the word) I have done on the boat’s engine has been very basic, and I am grateful that the 1 cylinder Sabb engine keeps chugging away. At some point I do think I need to take a trip to Braunston and have the legendary Jonathon look at – apparently he IS the man who knows! His old phone number is penned in one of my engine books – along with the old phone code. The limit of my engine knowledge is reflected in my stupidity the first time I viewed the boat. Some of you will remember I took as ‘normal’ an engine hole sloshing with water and an engine that wouldn’t start. However, for some reasons the Goddesses of the Cut were on my side and despite the water the engine has chugged on. Late in 2016 I did bail out 25 litres of oily dirty water…. I have no idea where it came from, but it was a total pain in the rear to get out. I began by using a hand-pump to syphon it into random containers, then it was a matter of sponging out the rest. It requires a contortionist’s skills to get into the engine hole and reach the floor with a sponge. Accessing the floor means dismantling a jigsaw of hatches, pieces of wood, walls and steps that cover the engine, plus the weedhatch cover f you actually want to see what you are doing – though this requires two screwdrivers to lever off the cover and a rope to haul the steel lid open. The other issue with all of this is that on a little boat there is nowhere to put the removed hatches, wood and stuff and it leaves my OCD head hurting when the boat is pulled apart and is in chaos. The water had sloshed itself around the engine tray and on the starboard side I couldn’t reach the water without going through the hatch at behind the toilet. This meant moving the toilet and accessing another door next to the engine’s radiator. Laying on the on the floor I was able to reach into the engine hole with a sponge to mop out the water. As I moor at the furthest point from the marina gate and carpark it felt like an additional challenge to carry all of the water back to my car for disposal – dirty bilge water can’t be dumped in the marina. 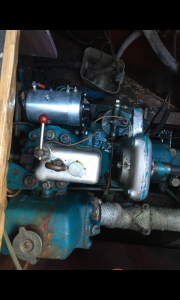 Having owned the boat a year in July 2017 I decided I really did need to do a mini engine service – I say this as I am sure there are other things I should have dealt with but I am not quite sure what they are! It does feel much easier accessing the boat engine than the car, as you can squeeze all the way round it. Although unlike on a car, when it comes to removing the oil from my engine there is no plug you remove to let the oil drain out, but rather you have to pump it out using a small pump and syphon it into a container. Luckily I had found the pump sloshing around in the 25l of water in the engine hole. Dad fixed flexible hoses onto the pump and away I went taking out engine oil and gear box oil before I replaced the oil filter. Despite bailing out the water the engine hole still looked pretty grim, a residue of mud and years of grime seemed to cover everything. I must admit I left cleaning out the engine hole until months and it was probably the dirtiest job I have done on the boat. It gave me dark pleasure to wear the the ex’s designer shirt for this job – he forgot to take it with him when he ran for the hills, if anyone would care to let him know he can have it back, please do! My Dad had given me a tin of engine degreaser and with the loan of a brush and a #10 tin can from my marina neighbour I began the hideous job of cleaning the engine hole. The idea of the degreaser is that you can paint it on and wash it off and ta-dah you have a lovely shiny engine. Of course with an engine hole that hasn’t been cleaned for a very long time, if ever, the dirt build up on Pea Green was grim. I had to paint on the degreaser, leave it to soak in, then wipe it off, then do the same over and over again. I had started by using rags, but as each time I had to wash them out I was creating move filthy water, so I shifted onto using kitchen roll, with a big bin bag at hand. The worst part of the job was probably clearing out the engine drip tray it was 5cm deep in oil, gunk and yuk, all of which had to come out. At the bottom, I found an oil absorption pad and I wondered how long it has been immersed in oil. Similarly, the container under the stern gland was deep in slime and the best thing to do seemed to be to ditch it. Finally, after days of degreasing and aching all over from the weird positions I had been forced into I managed to get back to cleanish metal around the engine. I must admit that I was pretty much losing the will to live. As Autumn was creeping on and the weather beginning to turn I was concerned I wouldn’t get the engine hole repainted and the paint dry before winter set in. (Yes, I know it probably wasn’t the most sensible time of the year to begin this endeavour.) Finally, with the grease removed I found a tin of Hammerite and painted the engine hole. So far I haven’t painted the engine, but this will need to happen before long, as the blue paint is beginning to peel, but right now it is engine service time once again, and that is the job for this week! Fun and games, Kay! Even having dealt with my boat’s engine for the past 13 years, I still find it the most intimidating thing about the entire enterprise. This year I replaced the starter and the fuel lift pump and discovered that the old lift pump had been wired wrong for as long as I’ve owned the boat. Cramped engine space, immortal dirt and grease. I don’t know how all those serious power boaters can stand it. At least you have a diesel and don’t have to worry about blowing yourself to smithereens. And those old one-lungers are famously reliable. Haha actually did the most recent oil /filter change last week 🙂 though still haven’t done the fuel filter, I forgot to bring the engine manual and could work out how to unscrew the filter housing! As always thanks for reading and commenting. 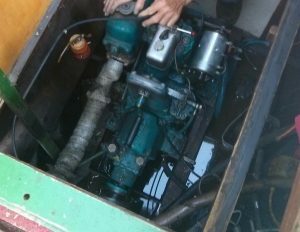 Another very amusing blog Kay – it is exactly the dreaded job that I now need to do with my newly purchased ‘project’ of a boat which appears to be in a similar condition to yours having been neglected for years and now has loads of oil / rags etc sloshing around the bilge. Hay ho – all part of the fun of boating. I love my left handed gadgets and the corkscrew is the best…. The leftie fish-slice is a dream, I think I need to acquire more!